At our last meeting, we were fortunate enough to have gifted artist Jane French give us a demonstration in portraiture using oils. Her source photo was that of her son, some years earlier. Starting with just a faint pencil sketch on canvas, Jane set about applying mid tones of paint first, working her way around the face in careful, deliberate strokes using a chisel edged brush for most of the time. A thinner brush was used only to pick out finer detail at the end. 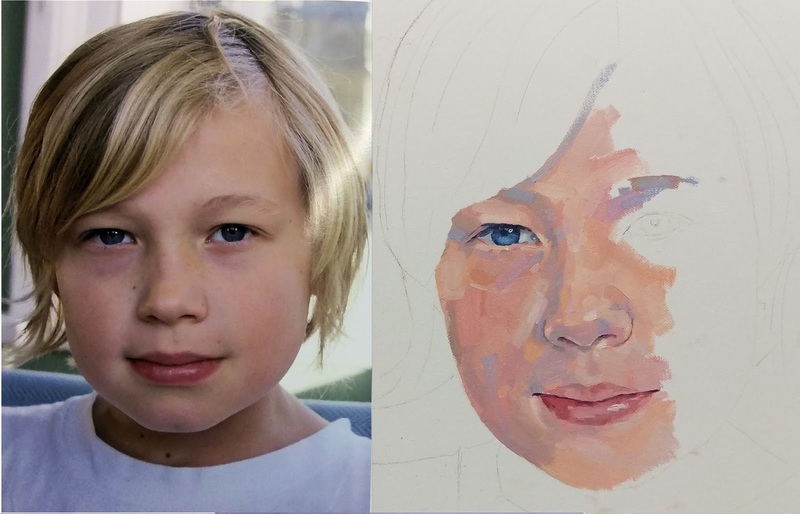 A final dash of white for highlight to the eye and lower lip had the effect of making the painting come alive, even at this early stage of development. Most of us could detect magenta and yellow in the face in the photograph, but we were amazed at how Jane could see blue and grey, which worked perfectly once we saw it applied. All in all, a lovely evenings entertainment, and much food for thought in respect of our own prospective paintings.